May 12, 1934, was a day of historic proportions in the United States. The largest dust storm in this country’s history marched through from the Great Plains to the Atlantic Ocean. 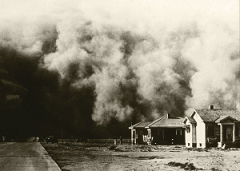 This event became known as the Dust Bowl Storm and prompted the need for soil and water conservation in the United States. On April 27, 1935, Congress passed and President Franklin D. Roosevelt signed the Soil Conservation Act. This established the Soil Conservation Service (SCS) within the United States Department of Agriculture (USDA). In 1937, Congress passed a resolution that was signed by the President which allowed states to become the channel for soil and water conservation assistance from the USDA to landowners. Through enactment of law, states could initiate a soil conservation agency that would allow local soil and water conservation districts to be formed. House Bill 646 passed on May 16, 1941. 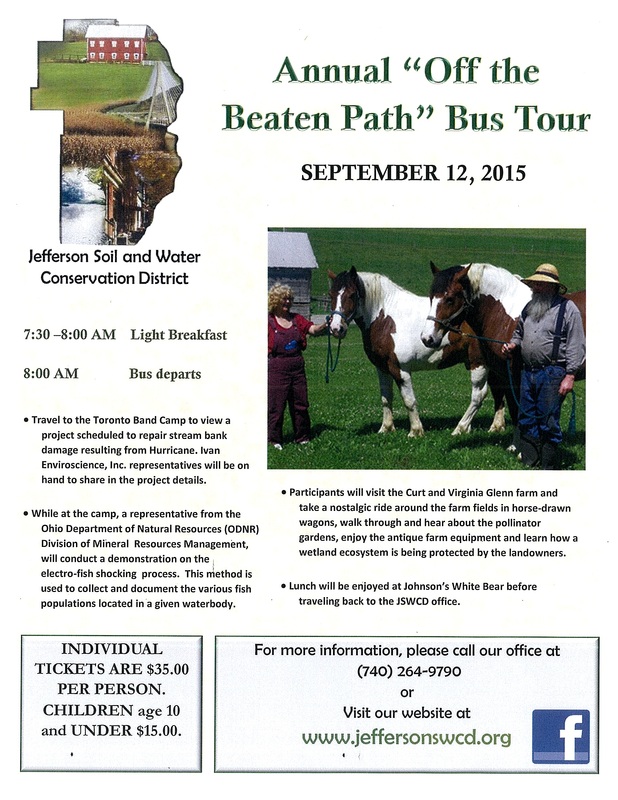 This is also known as the Ohio Soil Conservation District Enabling Act. When signed by then Governor John W. Bricker on June 5, 1941. It allowed the creation of local Soil Conservation Districts and the election of local District boards, in addition to laying out the authorities & responsibilities of the local District board. The origins of the soil and water districts in existence today are directly tied to the passing of House Bill 646. The 1st Board of Supervisors of Jefferson Soil & Water Conservation District. 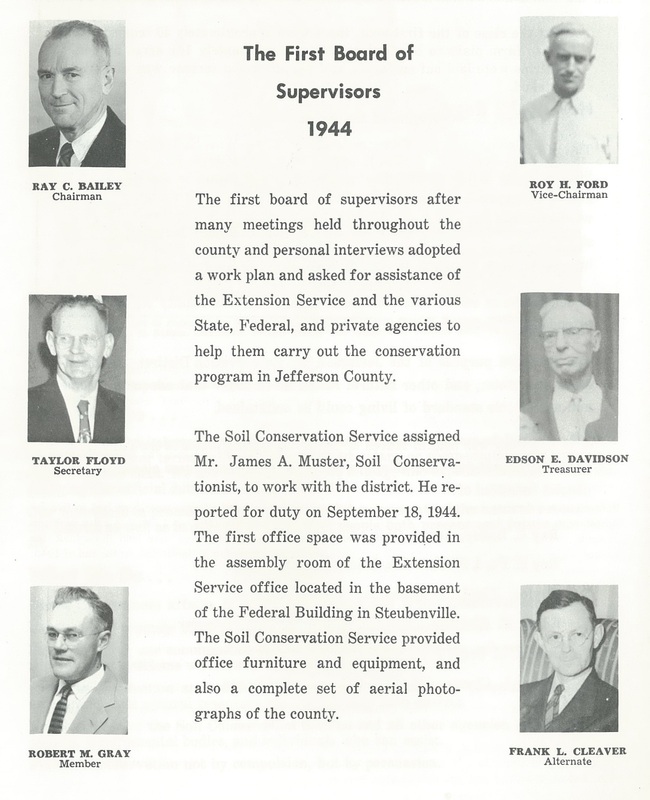 The Jefferson Soil and Water Conservation District (JSWCD) was organized in January of 1944 when County Extension Agent, Francis P. “Pop” Taylor called a special meeting of farm leaders. Taylor was the County Agent with the Agricultural Extension Service for nearly 30 years. He, along with a delegation of eleven Jefferson County farmers & the support of petitions, attended a hearing at the State Soil Conservation Committee in Columbus, Ohio. As stated in the JSWCD’s 25th Anniversary Annual Report: “The proposed purpose of the Jefferson Soil Conservation District was to conserve soil, water and other natural resources in order that adequate income and a desirable standard of living could be maintained." And the rest, as they say, is history. Over the decades, JSWCD’s purpose has not faltered. Our Board & staff are dedicated to the mission of promoting and educating wise land use to the public. The programs & services that we provide are all in the name of conservation as we continue to carry on what Francis Taylor began all those years ago. The Jefferson SWCD Board of Supervisors of 1968. 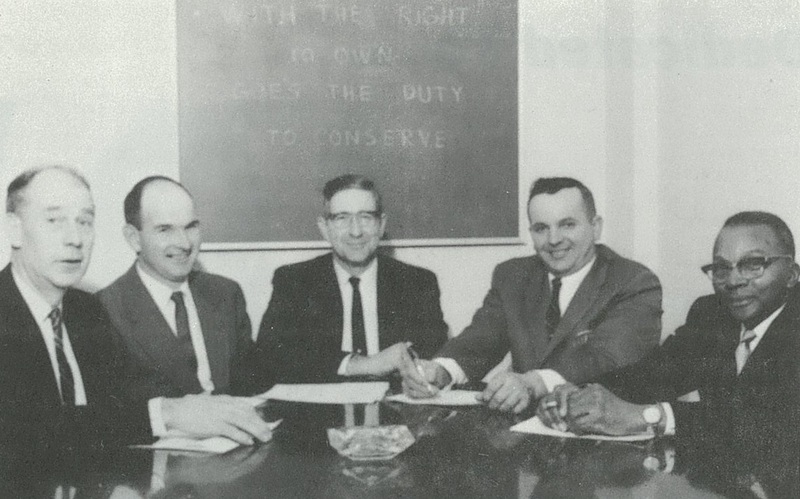 From left to right: Edgar F. Buchanan, Public Relations; Paul E. Ramsey, Secretary; Walter N. Sutton, Chairman; Joseph Rozsa, Vice Chairman; Vincent West, Treasurer.